June Garden & Patio Update - Oak House Design Co. I've been away for a while--busy with life. I can't believe it's June already. The Bub finished Kindergarten and we went on vacation to Charleston the next day. But the entire family got sick on the way down, so it was not the best way spend a vacation. We made the best of it and got out the hotel a little bit each day. I thought I would show you a bit of what's going on in the garden because that's the extent of excitement in my life right now. My garden is five years old this year, and I feel am slowly learning how to take care of it. When you see my grass, you may question that statement. But, one of my biggest discoveries is night gardening. It's so hot here by the time I go outside in the morning that it's hard to enjoy being outside. But I've installed some more garden lights this year and now I go out about 9pm and water the plants and hang out. It is so peaceful and calming. The perfect way to end the day. For the first time I am repeating my potted plants as well. I loved the look of potted herbs like lavender and rosemary last year. This year I've had them over a month and have kept up with watering them. I usually expect my plants to fend for themselves, but they need a bit of help, especially if they are in pots. First up, my annual herb pot. I keep this pot by the back door. This year, I upgraded to a ceramic pot that I hope to have for years. 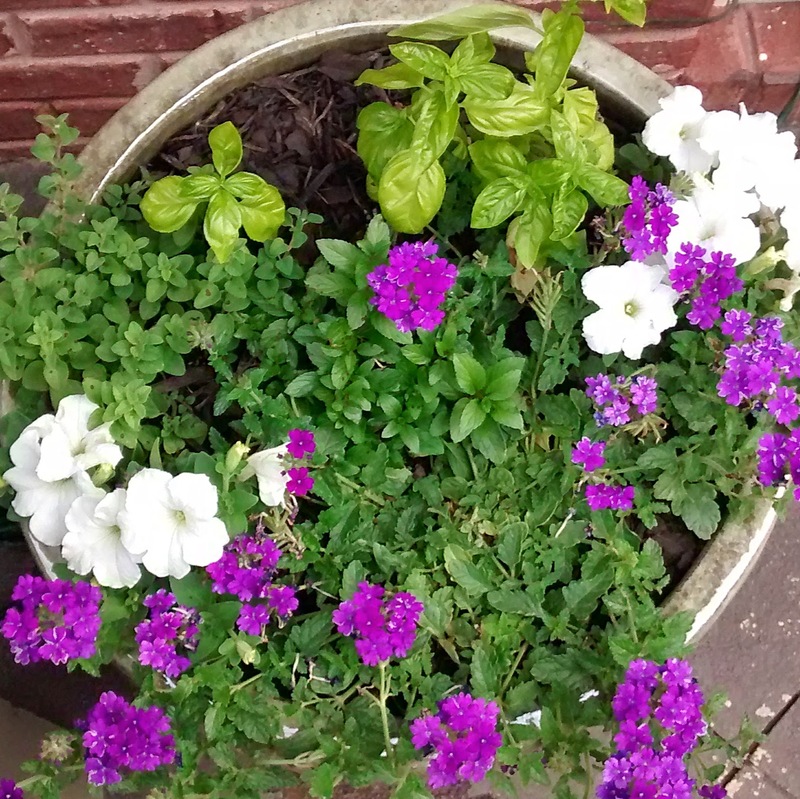 I decided to mix in some purple verbena and white petunias. But there's also mint, oregano, and basil. 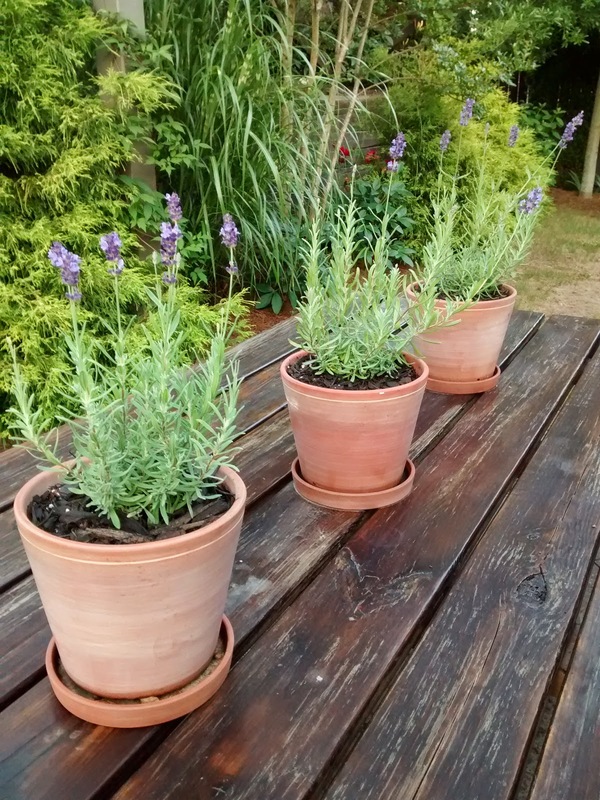 Three pots of lavender on the dining table. I think this is my favorite color palette in the garden. 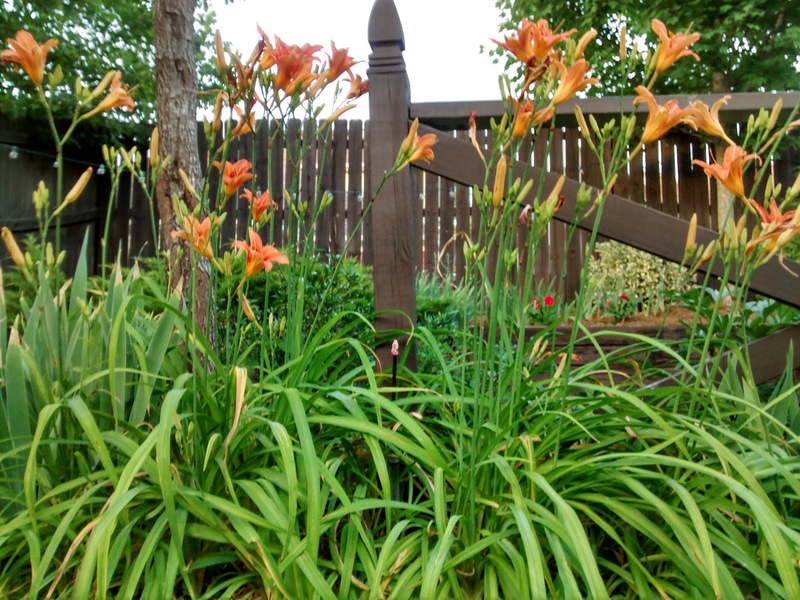 My native day lilies that I dug up from the side of the road. They bloom well in full sun but still need a bit of water. They were looking stressed, so I pulled out most of the brown foliage and I've started watering them every 2-3 days. My beloved "Endless Summer" hydrangea. 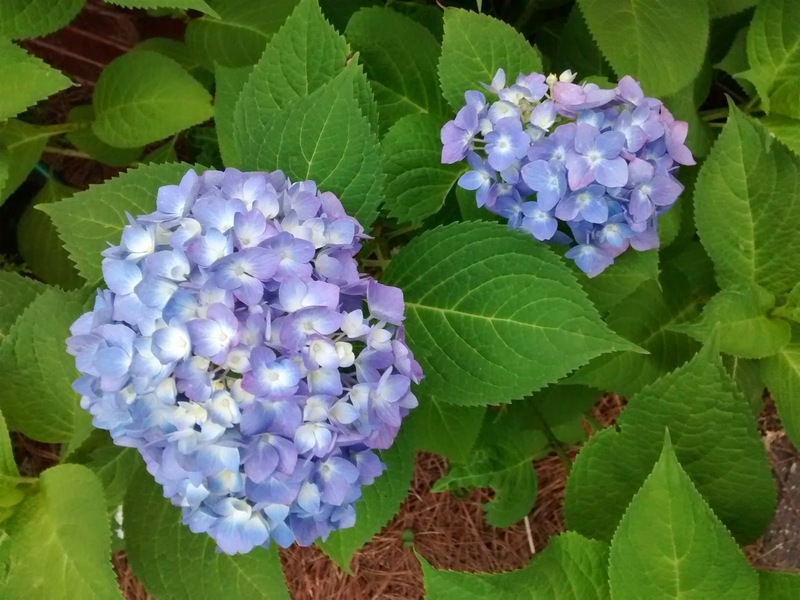 I bought hydrangeas when I first installed the garden, but they didn't survive. A couple of years ago, I bought two and planted them on the side of the house and they did OK. This year I transplanted one to a bare corner near the patio and watered it nearly daily for a couple of weeks. Now I water it about every other day. I can't tell you how happy that big purple flower makes me. This is why I wanted a garden. I did treat the weeds with chemicals and it has been pretty effective I suppose. But there isn't much lawn left. A smart person would probably call in TruGreen to take over, but I am a stubborn DIY'er, so I will not be doing that. 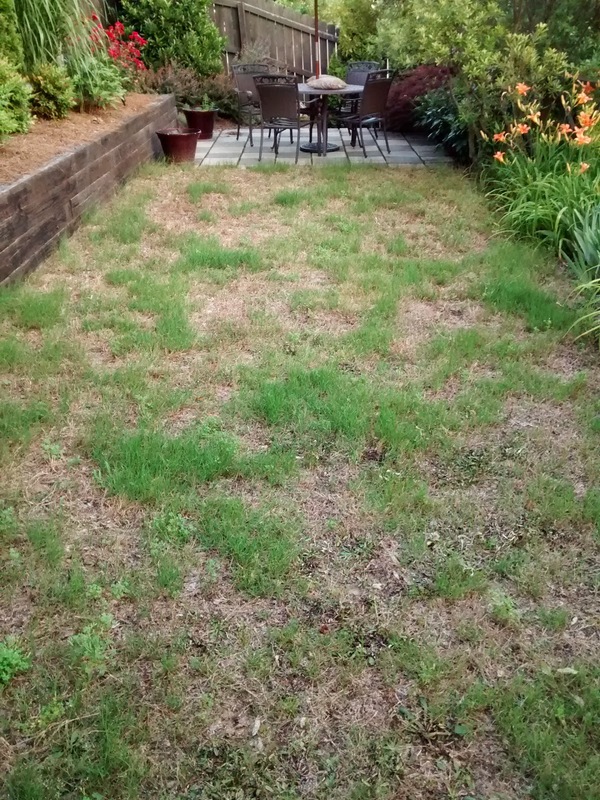 I attended a class offered by the county extension office in my area and according to their lawn care guide, it's best to reseed in the fall. I considered reseeding now, but it's so hot, I can't imagine it being able to survive. So this probably will not be resolved this growing season. If anyone has any suggestions, I am all ears. But that's the beauty of gardening. You always get a do-over next year. I am thinking of fertilizing and watering to see if this improves the situation. In the meantime, ahem, there's always night gardening. Oh, and just a quick peek at the front patio. It's a nice place to sit because it stays shaded all day. My favorite spot is that black wicker chair in the corner. I found a set of four at Goodwill for $30 last year, I believe. They were/are a bit run down, but I gave two of them a fresh coat of spray paint and some cushions. 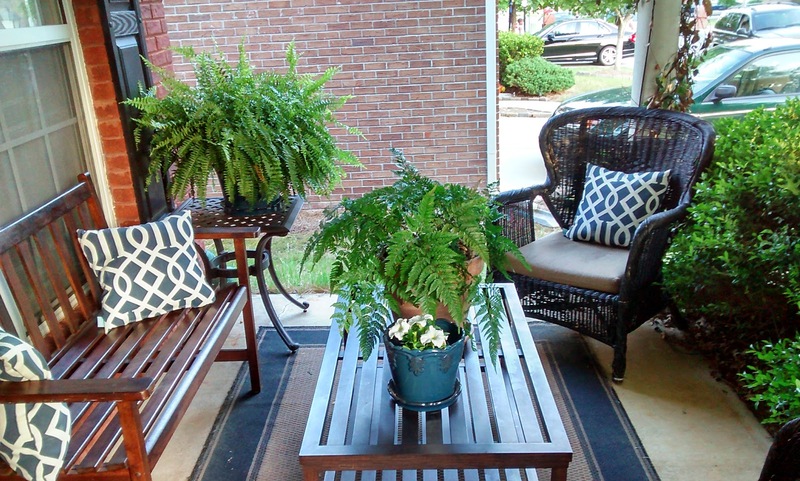 They are perfect for enjoying a cup of tea on the porch. I still have two in my garage that I need to refinish and find a place for. Hope you are enjoying the last few weeks of spring. Does it still feel like spring to anyone? I keep calling it summer, but it will be here soon enough.